The 1st Annual Volunteer was a successful day of friends and good food, with over 40 folks present and more food then we could eat! Though little Celsy helped out by eating a pasta casserole, before anyone realized what he was doing he picked up the lid and shoved his muzzle in and heartily approved the dish! He even loved the spinach and peppers! Barn Committee: These volunteers are responsible for duties directly involved with the care of the horses. Duties involve real farm work such as: Feeding, haying, mucking, cleaning, turning in and out, watering, and basic medical care. All of these duties on are ON-SITE. No skill is required to start and a volunteer orientation class is offered monthly. Chair: Sheila Stone 986-2170 or email to sstone1283@gmail.com. Next Orientation: May 19 at 2:30pm at Easy Street Rescue in barnyard. Maintenance Committee - This team is for volunteers who have an interest or skills in handy/maintenance work. Mowing, gardening/landscaping, repairs, building/construction, painting, fencing etc., are the projects lead and accomplished by this committee. Chair Paul Bellinger email to pauljbellinger@aol.com. Meeting: May 19 at Noon?? at Easy Street Rescue’s trailer. Adoption/Foster Committee - These volunteers inspect potential adopters’ facilities, and check references on applications. Training is available and volunteers must be over the age of 18, use a computer, able to drive and have a digital camera. They will also create posters on adoptable/foster horses and distribute them to appropriate markets. Chair Kathy Hahn – email to hahn@frontiernet.net. Meeting May 12 at 1pm at Easy Street Rescue’s trailer. Event Committee- This volunteer will assist in planning and organizing events and fundraisers. A volunteer will head up an event and other members assist in planning and organizing it. Then the Special Event Volunteers are called and asked to help on the day of the event. Chair Kathy Hahn – email to hahn@frontiernet.net. Meeting May 12 at 2:30pm at Easy Street Rescue’s trailer. Special Event Volunteers- These volunteers help on the various events during the year such as our annual Open House in May, Garage Sale in August, County Fair in Aug/Sep, and “Run for the Horses” in October. These volunteers do not plan the events, but they staff them on the day of the event.. Please come to Event Committee meeting and/or email Kathy with your phone number. Education Committee - Volunteers within this committee assist with the education to the public and the community about the need to help rescue horses. Chair Nina – email to easystreetrescue@aol.com. Emergency Response Committee - This team assists with impoundments and horse emergency response. Training is available for qualified individuals. Some volunteers must have horse experience, others are responsible for manning a hot line to members on the team when an emergency horse rescue occurs. 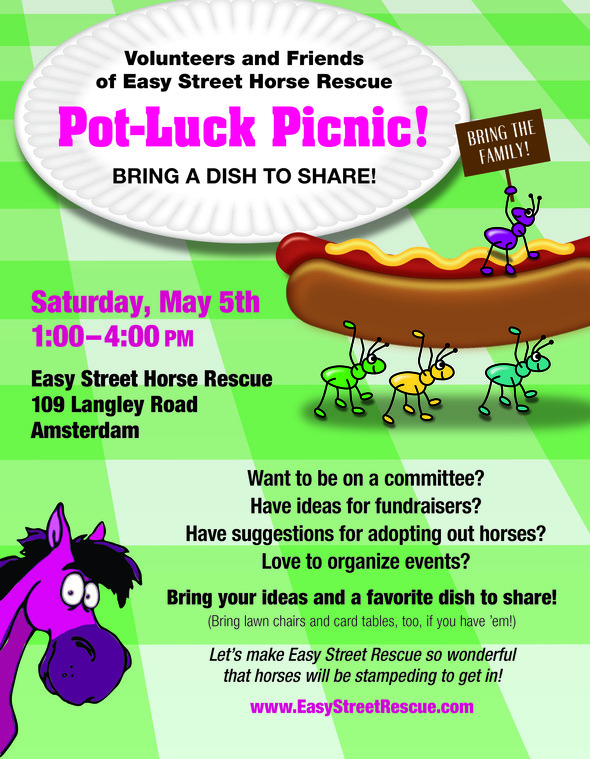 Please email Nina your desire to be on this committee to easystreetrescue@aol.com Be sure to include your phone number, indicate your ability with horses and if you have a horse trailer or able to borrow one. Office Volunteers - Experience is preferred but not required in data entry, filing, mailings, write “thank you” notes etc. Office help is needed a day or two a week and must be pre-scheduled with Nina Bellinger, Director. If you can help please email Nina at easystreetrescue@aol.com.